Today people use many forms of transport, but cars still represent a big part of everyday life. The data show that most car manufacturers have already met their individual 2012 targets. However, several others need to continue their current trend of year-on-year efficiency improvements. Road transport is responsible for 17.5 % of overall greenhouse gas emissions in Europe and its emissions increased by 23 % between 1990 and 2009. To reduce the CO2 emissions of the road transport sector, European legislation has introduced mandatory CO2 emissions limits for new passenger cars. The average emission level of a new car registered in the European Union in 2010 was 140.3 gCO2/km. Overall, car manufacturers must achieve a CO2 emission target of 130 g CO2/km by 2015 as an average value for the fleet of new cars registered in the EU. This target will be gradually phased in from 2012. 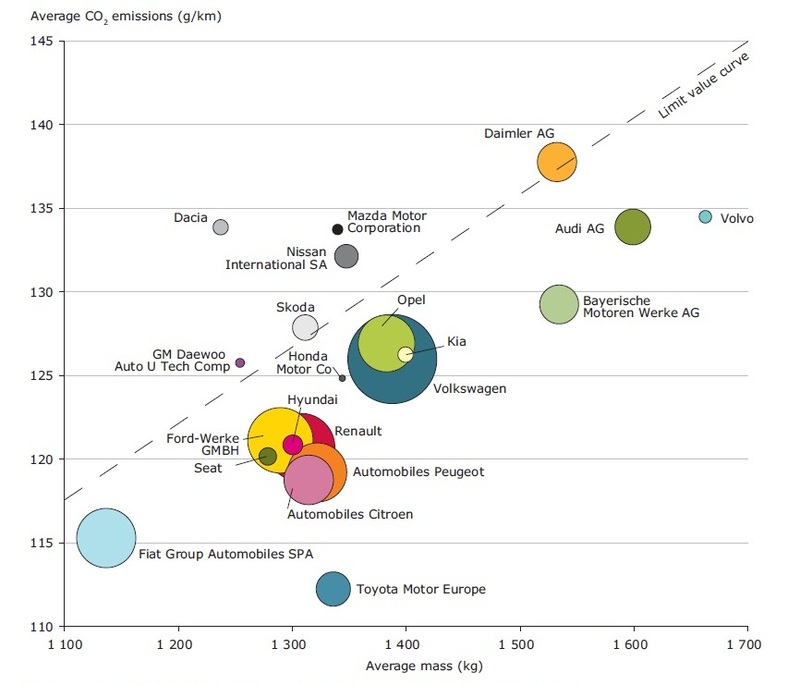 Specific emission targets (expressed as an amount of CO2 emissions per vehicle kilometre) are assigned to each car manufacturer (or pools of manufacturers) depending on the average mass of the fleet. A manufacturer (or pools of manufacturers) producing on average larger new cars has a higher target. The new data published by the EEA today considers the distance to the 2012 and 2015 targets for the vehicles sold in 2010, showing which manufacturers must make further progress towards the targets. Fines for failing to meet the target (also known as ‘excess emissions premiums’) will be calculated on a progressive scale for each additional gram of CO2 above the target, multiplied by the number of cars sold. Thirty-two manufacturers, representing almost 80 % of 2010 registrations in the EU, already achieve their 2012 specific emissions targets two years in advance. If car manufacturers make no further improvements in carbon efficiency of new cars between 2010 and 2015, non-compliant manufacturers could face fines which in total would add up to €10 billion. Toyota Motor Europe is already compliant with its 2012 target, and also less than 1g CO2/km from the more stringent 2015 target. Automobiles Peugeot and Automobiles Citroën are also both close to reaching their 2015 target already. These manufacturers need to cut their emissions by less than 5g CO2/km to meet the target, a value corresponding to the average reduction of emissions from new passenger cars between 2009 and 2010 in Europe. Among the larger manufacturers, Daimler AG, Skoda, Nissan International SA, General Motors Daewoo, Mazda Motor Corporation and Dacia will have to reduce the average emissions of their fleets by more than 14 g CO2/km over the next five years. There are three manufacturers which produce only electric vehicles – so their emissions are listed as zero. Of the manufacturers producing some conventional-fuelled cars, Maruti Suzuki India Ltd had the lowest CO2 emission level overall (104 g CO2/Km). The average mass of its fleet is the lowest among all the car manufacturers registering vehicles in Europe. Among the larger manufacturers, Fiat Group Automobiles Spa had the lowest average CO2 emissions in 2010 (125 g CO2/km). At the other end of the spectrum, some carmakers will need to halve emissions in the next four years in order to comply with the legislation. The legislation provides for incentives to car manufacturers to reduce the CO2 emissions of their vehicles. For calculating average emissions, certain types of vehicles receive additional incentives, including super credits for low emitting vehicles (<50g CO2/km) and other credits for biofuels and certain efficiency measures. Manufacturers' progress will be monitored each year by the European Commission and the EEA in order to track the performance against individual targets. Note: The size of the bubble is proportional to the number of vehicles registered in Europe. For references, please go to https://www.eea.europa.eu/highlights/most-carmakers-must-further-improve or scan the QR code.